Here he is, "Baldor the Great." Well, I suppose, he's more like "Baldor the Pretty Good." 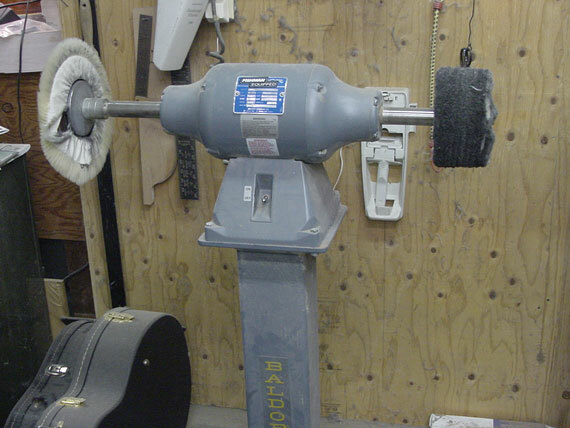 Around 25 years ago, before the dawn of civilized lutherie, we went looking for buffing machines and came up with this 1-hp Baldor buffer. I mounted it on this cantilever pedestal for a bit of extra clearance so we could slide guitar bodies underneath the motor housing. 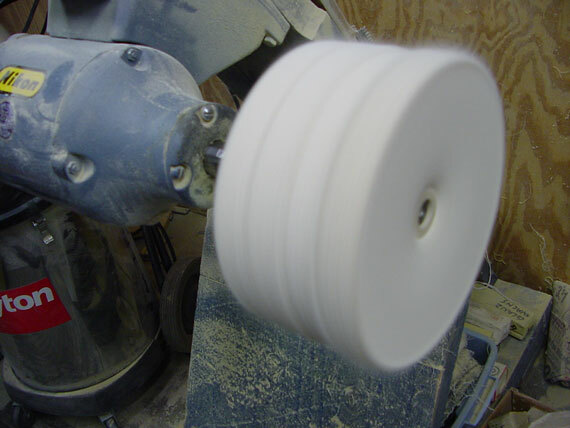 The motor is a single speed, 1750 RPM affair, so I have no control of the buffing wheel speed. 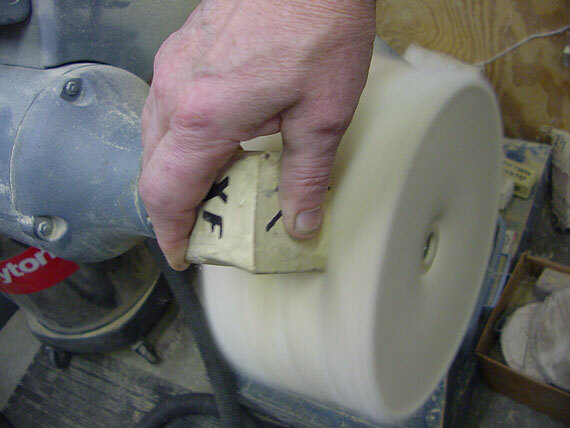 Soon after investing in this tool, I began to hate the high speed that prevents me from using any buff over eight inches in diameter for fear of generating too much heat while buffing sensitive lacquer finishes. But I learned to live with the speed by keeping the buff size relatively small. 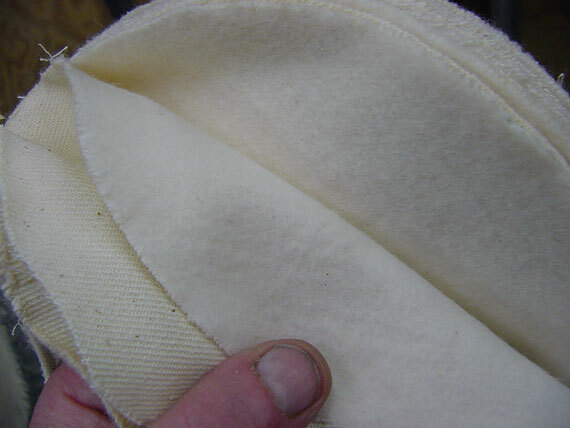 In fact, we eventually got a second machine, which we keep fitted out with a lambs wool bonnet on one end to handle final polishing of soft finishes, and a metal buff on the other, for banjo parts and stuff. 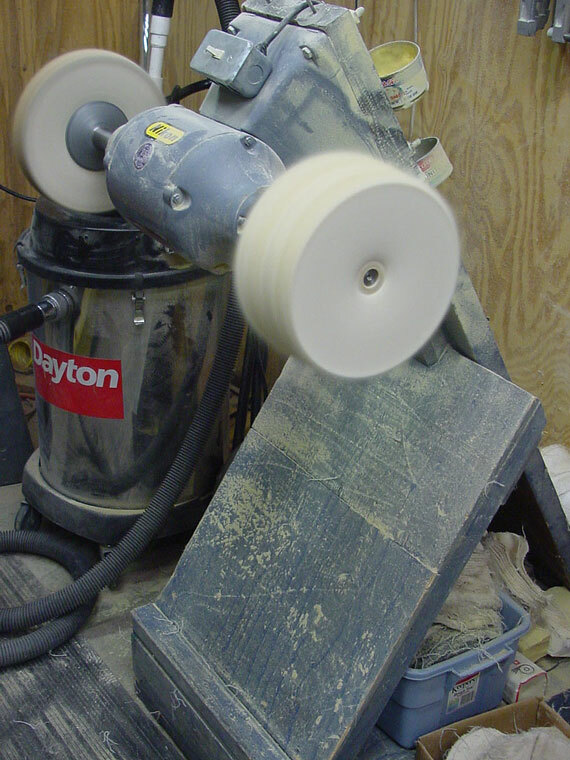 In this little article, I'd like to show how I set up the buffer for polishing finishes. I like to have the flexibility of a number of different buffs for the various finishes I encounter in repair. 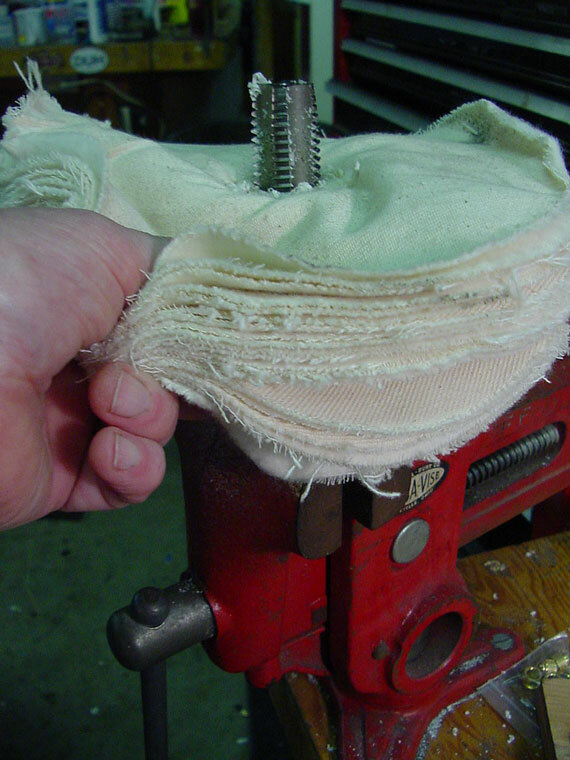 So, in addition to the lambs wool bonnet on the other machine for soft finishes, I have this relatively hard cotton buff mounted and charged up with medium Menzerna compound (I really like the Menzerna compounds that L.M.I. sells) for heavy buffing on polyester finishes. Here's that nasty shaft end, along with the stabilizing collar that's normally part of the buffing setup. I use a 10-inch buff because I don't have to worry about heat buildup on those polyester finishes. Here's the part I wanted to show off. On the right end of the shaft, I have the buff mounted with no external nut at all, so I have really great clearance all around the outside of the buff. It took me a while to work this out, and it has been so important to me that I thought you might be interested. Check it out. 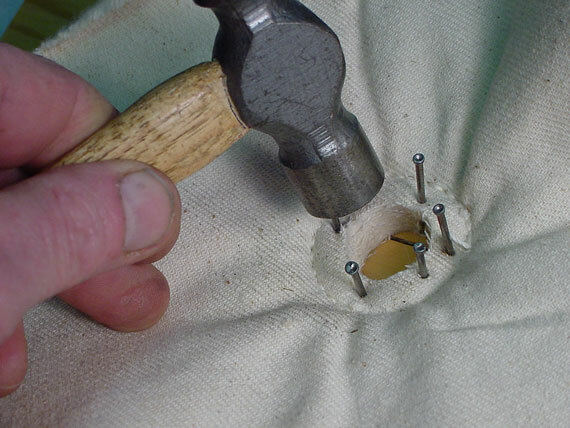 I can go right into the corner of the neck joint without fear of touching the finish with a big rotating nut. 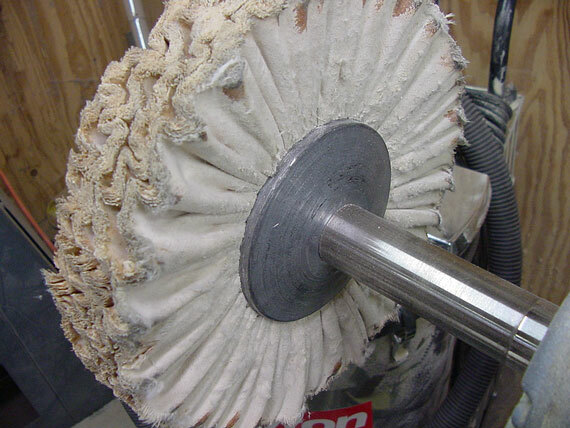 Well, this buff has been on the shaft for about four years now and has worn down considerably. 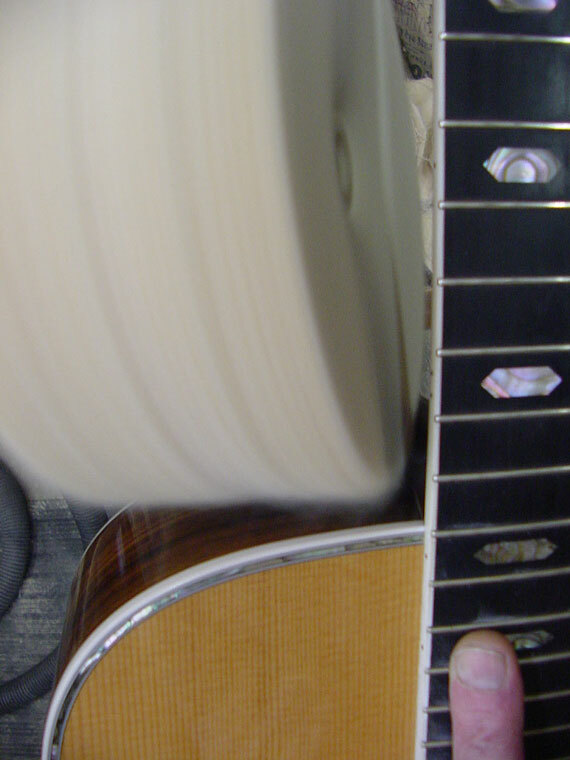 The tapered shape comes from those years of leaning guitar bodies against the right end to avoid the left side of the body touching the motor housing. Seems a bit goofy to do things this way, but it works very well once you get used to it. I took this photo on the day I decided to change buffs, so I could illustrate how I have them arranged. Unfortunately, I got interrupted, and another year passed before I actually did the job. Now, this is the real day I'll change the buff. 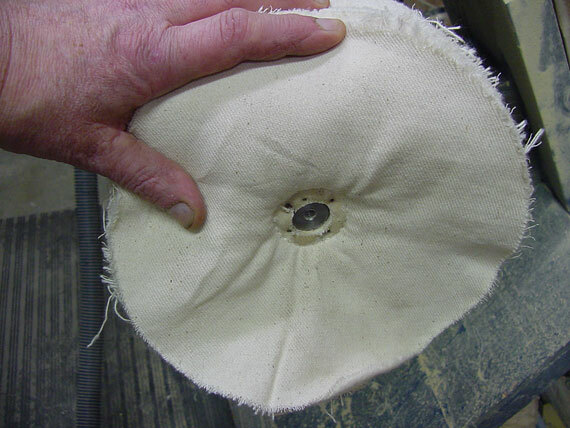 The old buff has worn down another inch,, so the narrow end is only four inches in diameter. It looks puny alongside the 8-inch original size. It's also a testimony to the fact that we adapt ourselves to what we're doing as changes come along. It became increasingly harder to avoid the motor housing with guitar bodies, and the surface speed was diminished by 50%, but the change came so slowly I hardly noticed it. Here's the new buff. 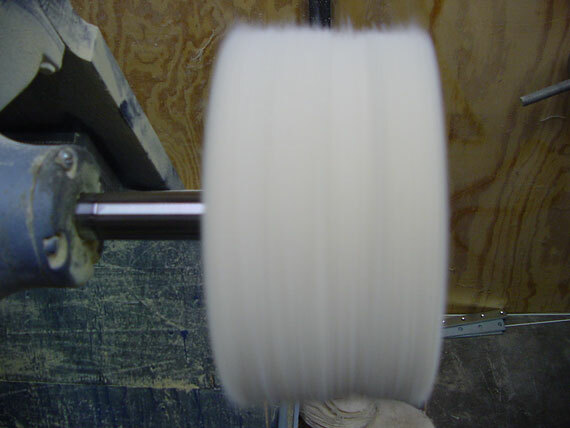 I use these light, fluffy cotton flannel buffing wheels that are about a half inch thick with about two dozen layers. The buffs never seem to be available with a 7/8" hole to match my arbor, so I made up this nasty core drill to cut the holes I want. 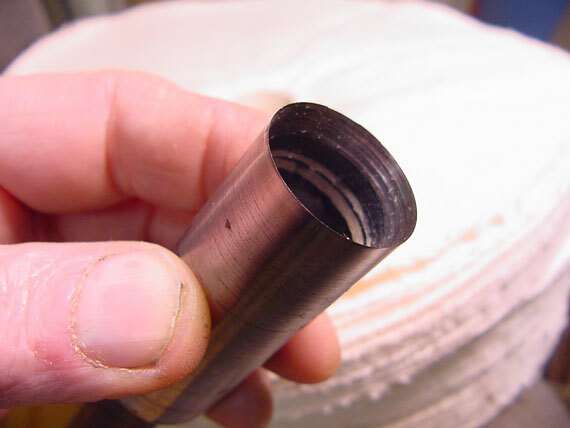 It was a lathe project, boring and turning a piece of drill rod, and sharpening the end to a fine inside taper, like a great big version of a paper drill. 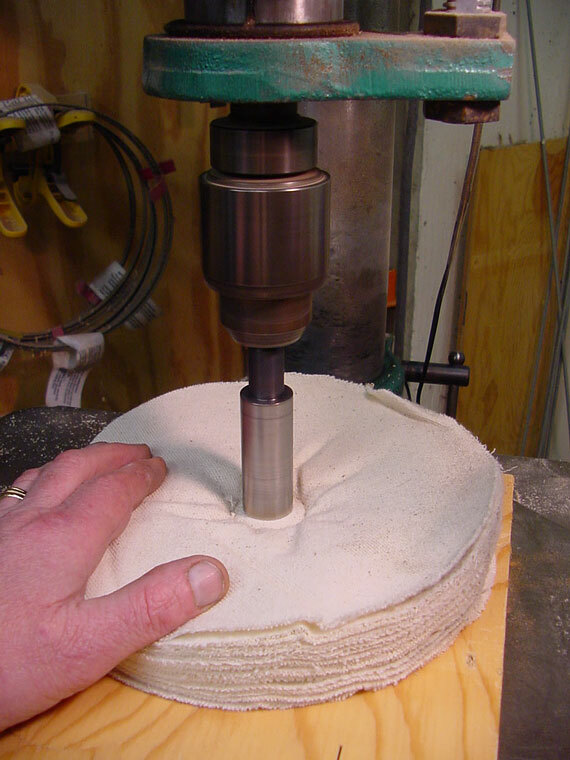 At a slow speed on the drill press he toothless drill slices cleanly through the buff without dragging or grabbing. 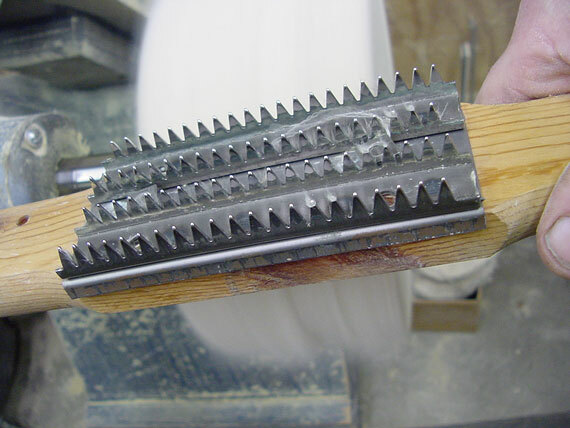 I didn't even try to harden the steel because it would only be cutting a few layers of cotton every few years. 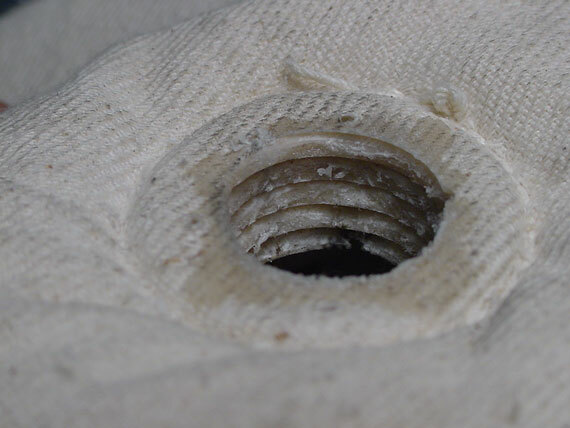 The drill makes a perfect 7/8" hole, neat and clean. 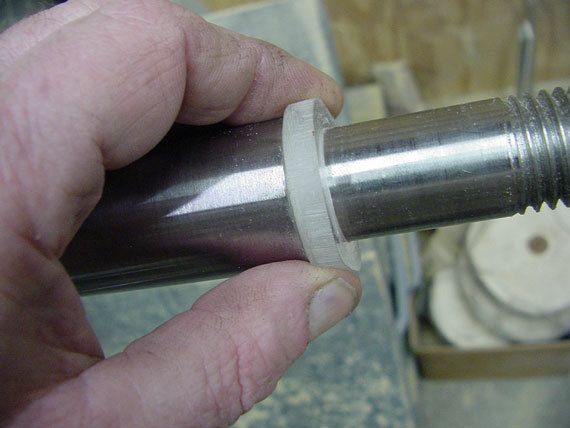 I made up some 1/4" acrylic spacers, and one of them goes on first to contact the shoulder of the shaft. Then a buff, and two more spacers over the unthreaded portion. 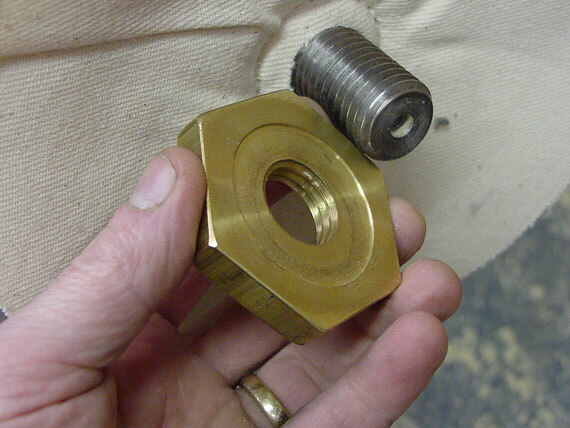 Another buff, one spacer and a giant nut I made from some scrap brass. 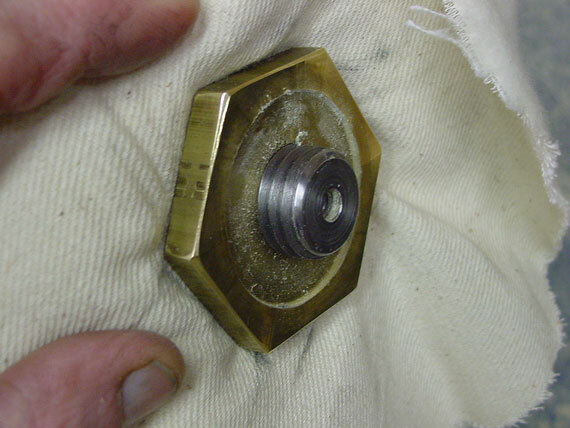 The nut is there to keep the buffs tight and to increase the space to 1/2" between each of the buffs. A third buff, another spacer and another nut. 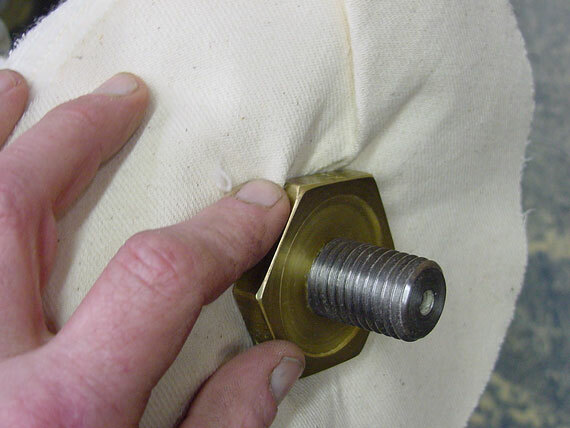 Each time I add a nut, I tighten it down by hand as far as I can turn it. The fourth buff, spacer and nut assembly just fit on the end of the shaft. 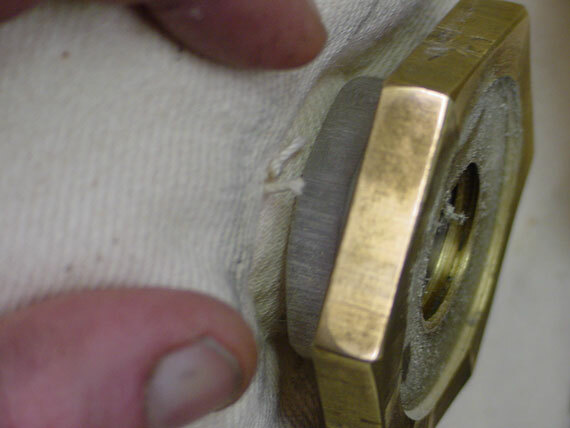 After tightening all the buffs and nuts by turning the buff while Mike holds the other end of the buffer shaft, I can get the last nut seated with a little less than 1/2" of the shaft protruding. Here's the tricky bit. 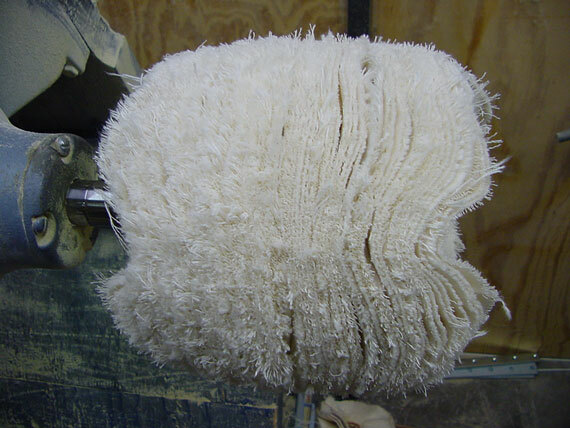 The fifth and last buff gets nailed down to a work board on top of a piece of waxed paper. 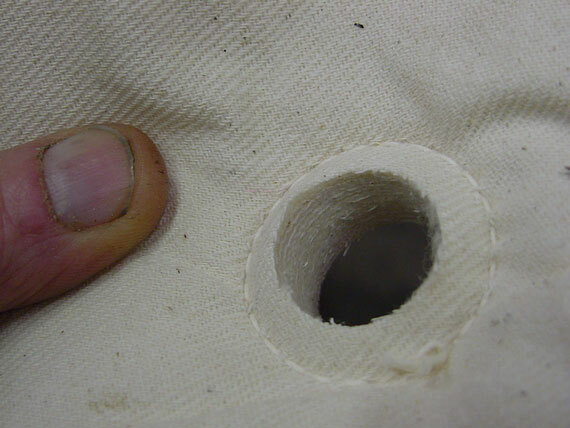 The nails tend to fluff the cotton fabric inward, reducing the diameter of the hole quite a bit. 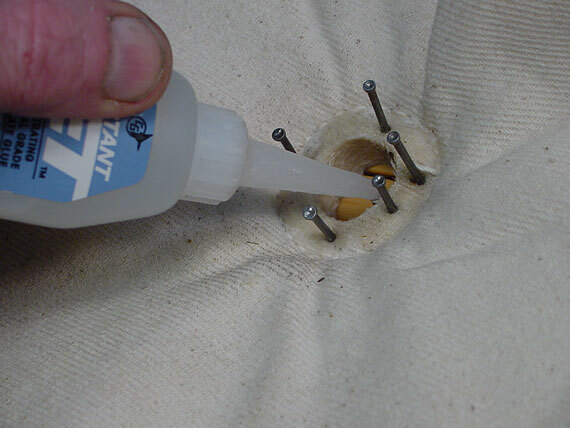 Then, I soak the center section with thin viscosity cyanoacrylate and wait a minute for it to harden. In the cotton fabric, the reaction proceeds so quickly that heat and smoke are generated. 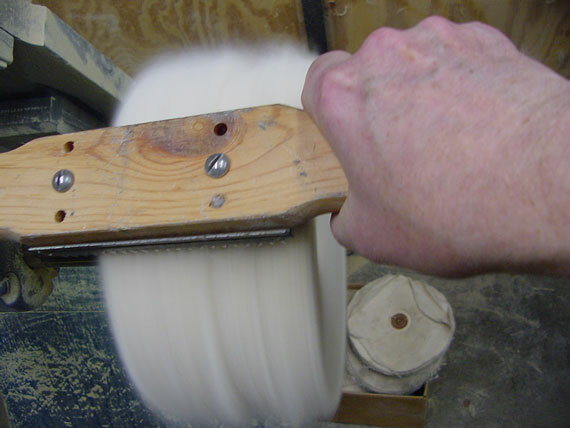 With a 7/8-13 tap clamped in my vise, I simply spin the buff downward, cutting a neat set of threads on the inside. 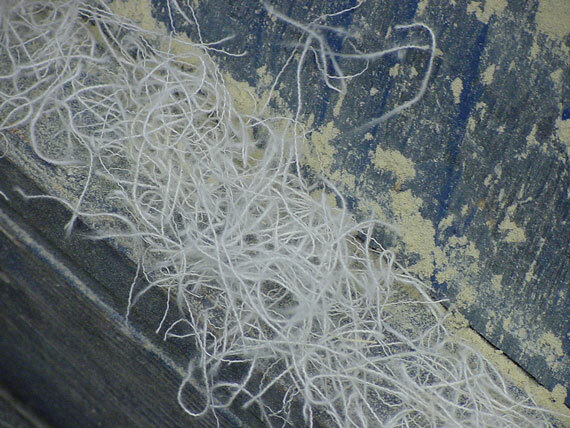 The cyanoacrylate has formed a strong matrix with the cotton, and the threads are nice and solid. 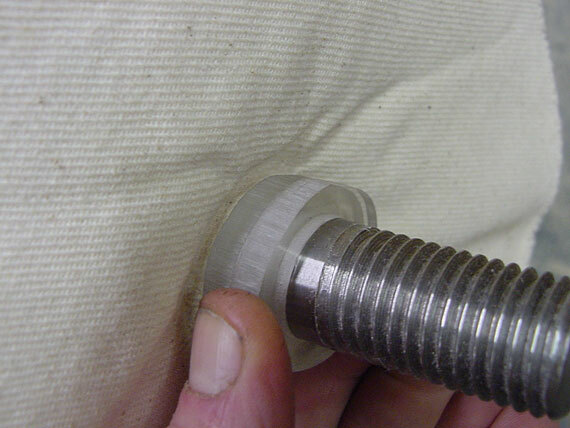 Then, I can screw the last buff on by itself leaving the shaft completely protected by the final layers of fabric. Here's the whole business in place. 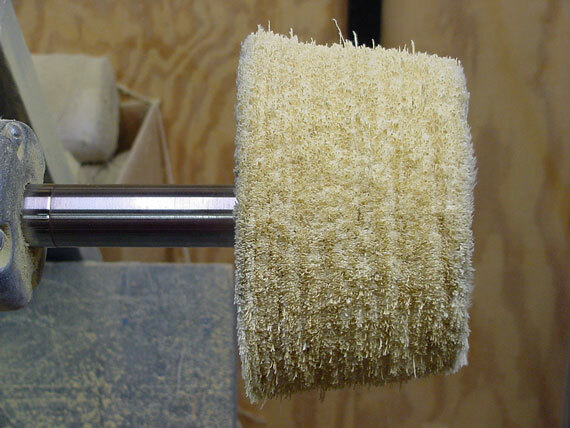 The five 1/2" buffs, spaced 1/2" apart make a fluffy buffing surface that will conform more easily to contours than a solid row of buffs. Up to speed, the buffs take the typical shape. 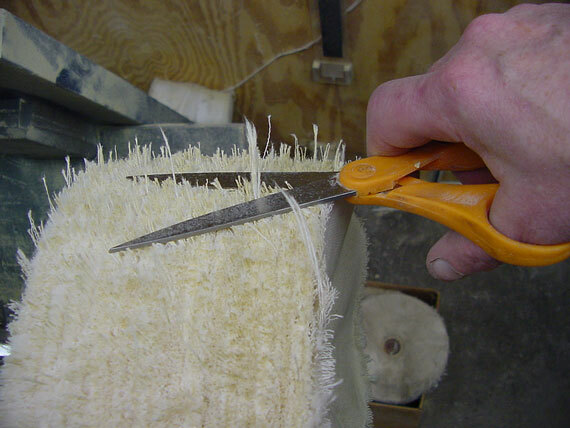 Truing up the buffs after installation is traditionally accomplished with a "rake" like this one. 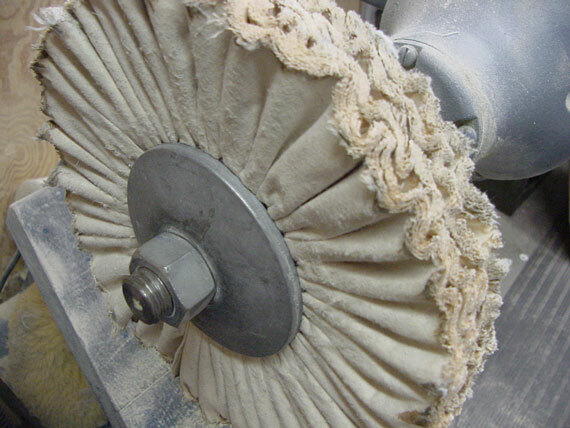 Acting kind of like a freehand lathe, the rake shreds the buffs down to an even contour as the buff speeds at 1750 RPM. Strings go EVERYWHERE as I true up the new buffs. 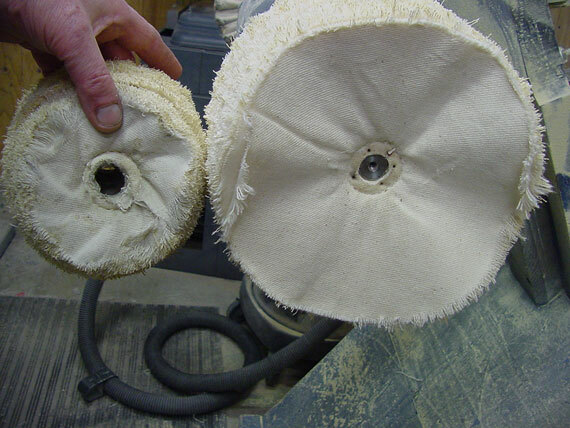 Repeated raking and trimming loose threads eventually pays off in the form of a nice round buff. Then some Menzerna compound. 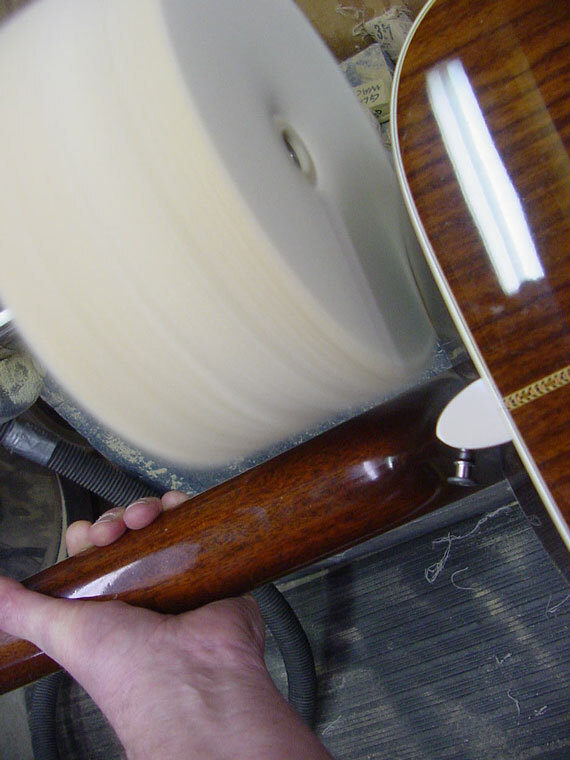 For most lacquer buffing, I use the extra fine grade. I load on as much as I can by rubbing the buff while it's rotating. 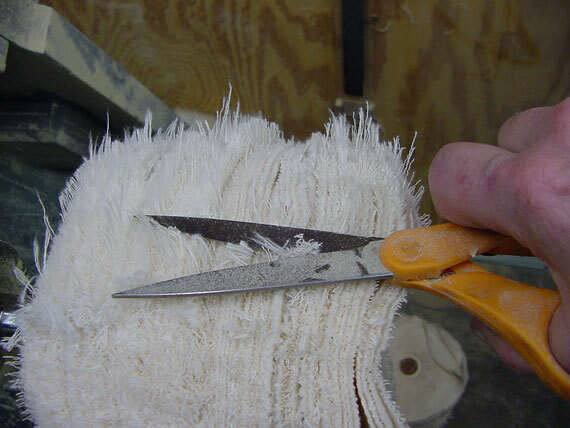 And, each time I apply compound, more threads are raised, so I keep my scissors handy. Here we are, ready to go. And once again, because there's no end sticking out, I don't have to worry about hitting the shaft against a fine finish. Up to speed, those shafts and nuts are about as friendly as circular saw blades.